The Department of Linguistics offers a major in Linguistics, leading to a B.A. degree. Students may choose courses which focus on Applied linguistic skills, or Analytic linguistic skills. There are also three TESOL Certificate options which can be taken along with a Linguistics degree, added to other programs of study at TWU, or taken part-time through TWU Extension. Linguistics is the study of language and how it is used in any society in our global community. The courses teach the crucial skills needed for learning and describing languages, even those which are unwritten. These skills include the recognition and pronunciation of non-English speech sounds, alphabet formation, and description of grammars and systems of meaning and beliefs. Courses are based on proven techniques drawn from decades of research in hundreds of languages of the world. Students of Linguistics have opportunities in the areas of translation, cross-cultural communication, international development (especially literacy programs), speech-language pathology, and teaching English as a second language. The major is good preparation for the Master of Arts in Linguistics program, offered through Trinity Western’s Faculty of Graduate Studies, or the Master of Applied Linguistics and Exegesis program, offered through Trinity Western’s Graduate School of Theological Studies. What is the current cost? How much does an average semester cost? TWU offers an average of about $2700/sem. CanIL offers an average of $500/CanIL Linguistics course taken for all the BA degree options below. CanIL offers church matching grants of up to $6000 for students enrolled in 3 or more CanIL linguistic courses each semester for a full academic year (usually in their final year of studies). It is recommended that students taking this degree program focus primarily on their core requirements for the first two years (approximately 80 semester hours of general programs, see the current TWU Academic calendar for specific course selections). 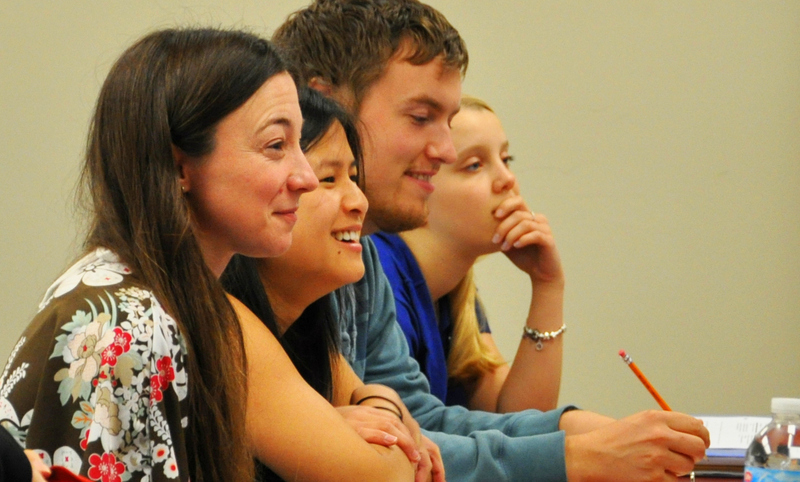 Linguistic students then have the option to attend the CanIL 9 week summer session, which offers the foundational Linguistic courses required for further training, or to complete these courses in the Fall semester. Linguistics degree students who have taken these foundational courses are best prepared to focus on their upper level linguistics courses. This introductory course investigates the English language itself (what we teach), the various ELT methodologies and classroom techniques (how we teach), and the participants in the teaching/ learning process (the who of ELT). LING 268 is a foundational course for further studies in the TESOL certificate program. The linguistics practicum course is designed to give students a short-term practical experience in a language development program. Students will work with a faculty member at TWU and a mentor on location to develop their ability as field linguists through making a contribution to language development work. The location, length of assignment, and work commitments will be determined by the faculty member in consultation with the student and the field mentor. 120 hours of work are required for the 3 semester hour course. This course covers typical first language acquisition in children. Major topics include phonology, vocabulary, grammar, syntax, pragmatics, as well as literacy development. The course uses a social framework and real-life examples that connect the diverse topics into a comprehensive picture of language development. Application to fields of speech-language pathology and audiology are also developed through sections on language impairment and hearing loss. This course is taught at CanIL-West and live-streamed by request. An examination of special topics or issues in linguistics that are not covered in depth in other courses. NB: Offered on a case-by-case basis, as needed. See Department chair. This course provides a theoretical and practical basis for analyzing the semantics of the lexicon, managing a lexical database and producing dictionaries for a variety of audiences including the local community, translators and linguists. Note: This is an undergraduate version of LING 587 Lexicography. This course will examine the philosophical basis of human language and communication, with special attention to issues relating to semantics, discourse, lexicon, metaphor, and translation–all the areas that deal with meaning creation. There will be a critical review of some major schools of thought within philosophy of language and hermeneutics. These will be examined in light of current insights in textlinguistics, cognitive linguistics, and integrational linguistics. TWU, in cooperation with the Canada Institute of Linguistics (CanIL), offers a Minor in Applied Linguistics. In addition to the general requirements of Trinity Western University for a Bachelor of Arts degree, students getting a minor in Applied Linguistics need to complete at least 24 semester hours of Linguistics courses. It is recommended that students take four courses during the CanIL summer session in July and August before either their third or fourth year in their program. However, these summer courses are also offered throughout the year. For more information on the TESOL certificate program, contact the TWU TESOL department. The nature of cross-cultural interaction, drawing attention both to the unexpected variations in other cultures as well as to the presuppositions from one’s own culture that inhibit cross-cultural communication. The need to take into account the dynamic of constant cultural change will also be emphasized. This course highlights the unique aspects of tutoring English language learners. Students use needs assessments to design individualized programs and lessons, as well as explore the business side of tutoring. In this course, students explore the sounds of English, transcribing them with phonetic symbols, and discover how these sounds function within English to encode meaning. These findings are then applied to assist language learners with their pronunciation. This course explores how words are formed (morphology) and used to create meaning and identifies common problems students encounter with vocabulary development in order to provide practical application for the classroom context. This course introduces the Canadian Language Benchmarks (CLBs) and their application to language assessment and lesson planning. Students are introduced to various methods of testing in TESOL for all four skill areas: reading, writing, listening, and speaking. Based on this knowledge, students create a variety of test materials for English language learners. An exploration of principles and resources for the teaching of pronunciation and application of these to the language learning classroom. Practical demonstrations of various methods for teaching beginning students with an emphasis on communicative theory and activities. Resource materials appropriate for classroom activities. An exploration of the history and theory underlying computer assisted ESL instruction, as well as the evaluation of online resources and the application of new technologies to both individual and classroom learning. Students explore principles of classroom management, especially as they apply to TESOL. They become familiar with current sources of information on classroom management, and begin to develop a personal classroom management system that is appropriate to the varied TESOL audiences. This course highlights the foundational principles of materials design and evaluation in English-language teaching. Students evaluate published and teachermade materials, and apply the principles to their own created materials in a practical workshop setting. This hands-on course provides an introduction to using drama techniques in TESOL. Students critically examine and reflect on how drama activities can be used to contribute to the TESOL classroom. This course examines the role English language teaching has played within the modern foreign missions movement. Criticisms of this approach are examined, issues clarified, assumptions articulated, and principles of a biblical, ethical approach are suggested.